You remember Barack Hussein Pbama, Junior's Aunt Zeituni, don't you? 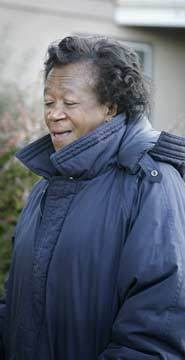 She's the aunt who was found living in public-housing and poverty. Zeituni Onyango is the half-sister of Pbama's father, Barack Hussein Obama, Senior. She is living in the U.S. illegally, having been ordered deported in 2004. Zeituni Onyango lives in poverty thanks to her nephew Barry. "[Zetuni's case] is unusual in American history because it's a relative of the president involved in immigration matters," said Mark Kirkorian, executive director of the Washington -based Center for Immigration Studies. "It really does present the White House with a opportunity of a minefield." [President] Obama has said he's had no involvement in the case and that is should run its ordinary course, White House spokesman Ben LaBolt said. [Zeituni] came to the United States in 2000 to find work and to seek a better life. Though she was ordered deported in 2004, she remained in the United States undetected until just before Election Day. Whoa. She's a fugitive. Prednint Pbama's aunt is a fugitive. Oh, my - how The Left would be politicizing and sensationalizing this if it had been W's aunt. "I think America's greatest moral failure in my lifetime has been that we still don't abide by that basic precept in Matthew that whatever you do for the lest of my brothers, you do for me." I guess for Pbama, his own aunt doesn't meet the definition of "the lest of [his] brothers." Worse, she is one of his greatest moral failures. Oh, That Barry. He sure is compassionate, yes?